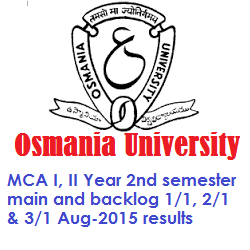 Osmania University today released the MCA I, II Year 2nd semester main and backlog 1/1, 2/1 & 3/1 Aug-2015 results. Osmania University, Hyderabad, Telangana State is conducted the MCA 1st Year and 2nd Year 2nd Semester Examinations in August 2015 and also conducted the MCA Backlog 1/1, 2/1 and 3/1 Examinations in August 2015. Today i.e., on Thursday 29th October 2015 the OU is released the Examination Results of MCA 1st and 2nd Year 2nd Semester results along with MCA Backlong 1/1, 2/1 & 3/1 Examination Results 2015. We are here providing the Direct links from which you will get the above examination results directly using your Hall Ticket No which is allotted for at the time of examination to write the examination. You can just click the below link and Please Enter 8 Digit Hall Ticket Number Ex: 94120022, 94135003 after that click on Submit Button. That's all you will get your result displayed.